This entry was posted in TNT on 21 August 2009 by Mr. Morrow. TwoMorrows’ Michael Eury at Geppi’s Entertainment Museum this Saturday! OFFICIAL PR BELOW: If you’re in the Baltimore area this weekend, be sure to stop by! Geppiâ€™s Entertainment Museum (GEM) in Baltimoreâ€™s historic Camden Yards sports complex will host a signing on Saturday, August 15, 2009, from noon to 3:00 PM, to mark the debut of the brand new edition of the critically acclaimed Captain Action: The Original Super-Hero Action Figure by Michael Eury. In addition to the author, Ed Catto and Joe Ahearn, the owners of Captain Action Enterprises, will be in attendance for the signing. The event will also kick off a special exhibit covering the history of Captain Action, from the first action figures in the 1960s to the latest merchandise (and everything in between). The exhibit will run from August 15 through October 13, 2009. Published by TwoMorrows Publishing, Captain Action: The Original Super-Hero Action Figure chronicles the history of this quick-changing champion, including photos of virtually every Captain Action product ever released. With spotlights on Captain Action, his allies Action Boy and the Super Queens, and his arch enemy Dr. Evil, an examination of his comic book appearances, and more, nearly every facet of the characterâ€™s existence is put under the microscope. From the earliest concept stages to the multiple (and supposedly final) demises of the toy line, and from thriving collectibles market to the modern resurgence, no stone is left unturned. It is due in stores on or about August 10.
â€œWeâ€™re very happy to see Captain Action and Michaelâ€™s wonderful book given such a spectacular stage. Like many other collectors, Ed Catto and I really enjoy telling other enthusiasts about our favorite character, and this takes that enjoyment to the proverbial next level,â€ said Joe Ahearn, Partner of Captain Action Enterprises. The original superhero action figure first arrived on the scene in 1966 with the ability to change into a fantastic range of other incredible heroes, including Superman, Batman, Captain America, Spider-Man, the Lone Ranger, Buck Rogers, and the Green Hornet. He took on their costumes and personas and fought the forces of evil in their places. Produced by the Ideal Toy Company and developed by Stan Weston, who had been involved in the genesis of Hasbroâ€™s G.I. Joe just two years before, Captain Action enjoyed a fairly brief shelf life. The last of Idealâ€™s original production runs ended in 1968. In that short time, though, the 12-inch action figure had also doubled for Aquaman, Flash Gordon, the Phantom, Steve Canyon, Sgt. Fury, and Tonto. He had a sidekick, Action Boy (who became Superboy, Aqualad and Robin the Boy Wonder) and a blue-skinned, bug-eyed alien arch foe named Dr. Evil (obviously years before Austin Powers fought another Dr. Evil). There were playsets, vehicles, a headquarters, flicker rings, playing cards, a Ben Cooper Halloween costume, and a fondly remembered five-issue series from DC Comics that included contributions from such legends as Wally Wood, Jim Shooter, and Gil Kane. As the years followed, Captain Action became the purview of the collecting community. A thriving secondary market developed and kept interest in the character alive within its ranks. In 1998, thirty years after the original production run ended, Playing Mantis brought Captain Action back to the world of new toys. Although their tenure with the toy line would also end after two years, it greatly fanned the flames of interest in the character and the original collectibles, and led eventually to the formation of Captain Action Enterprises, the present day owners of the intellectual property. The exhibit will conclude just after the Diamond Comic Distributors â€“ Alliance Game Distributors Retailer Summit, which will be held at the BaltimoreConvention Center, immediately across the street from GEM, October 11-13, 2009. This entry was posted in TNT on 10 August 2009 by Mr. Morrow. WHERE WERE THE CROWDS? Everywhere! It was just an insane mob scene every day, except Saturday, which was relatively quiet (still busy, but much less than other days) at our end of the hall (because a large percentage of attendees were at the other end and upstairs, standing in line to see all the big Hollywood panels and booths). It used to be Saturday was our biggest sales day, and Sunday was kinda slow; now it’s the exact opposite, as all the folks who spent the rest of the week at the Hollywood end of the convention center, realized they missed out on much of the comics end, and swarmed down on Sunday to take it all in. By mid-day, Rand Hoppe, Tom Stewart, and I (the three of us manned the booth all week) all had a bit of a glazed look on our faces, from so many days of dealing with so many people, so much noise, and so much craziness. But in a good way. WHERE WERE THE COMICS? A lot’s been said about the diminishing presence for comics at what’s becoming a mass media event that more and more focuses on Hollywood blockbusters, science-fiction, Twilight, etc. LEGO’s even becoming a bigger part of the con lately (due in part to us and our BrickJournal magazine and panel, and the LEGO Group’s efforts to expand their presence, even more of which we’ll see next year). But while the con has grown by leaps and bounds in the last few years, I don’t see where much (if any) of the growth has been geared toward the comics scene. To my eyes, there’s no more comics-related material/exhibitors/panels now than there was four or five years ago; it’s stayed about the same (and my very unscientific sense this year was that the comics-related exhibitors were actually a little fewer than last year). As the costs of booths, transportation, and especially lodging continues to increase there, I’m pretty confident we’ll see a bit more shrinkage of the “comics” in Comic-Con (with eBay so ingrained in fandom now, I’m not sure why most of the back issue dealers even attend anymore; a lot of them had kinda long faces as I blew through the Golden & Silver Age Pavilion this year). Even so, there’s still plenty of comics publishers and panels represented; it’s just that contingent doesn’t seem to be growing along with the rest of the con. It’s at what appears to me to be a stagnant (or slightly declining) level. But the “comics” at Comic-Con are still bigger than any other convention in the US by far. So even if that aspect doesn’t grow, it’s still the biggest game in town (and country). WHERE WERE THE FURRINERS? Something that struck me last year, and much more so this year, is how few of the friends we’ve made over the years actually made the trip out for Comic-Con. Five years ago, I’d spend all five days constantly having conversations and catching up with pals we’ve made over the last 15 years, at least half of whom hailed from outside California. Especially this year, it was mostly “locals” who came by the booth. An informal scan of new and renewing subscriptions we signed up at the con shows roughly 95% of them were from the Southern California area. I know the economy’s bad, which accounts for the lack of people traveling far to attend the last two years. (And I can count on one hand the number of non-US readers I chatted with this year.) But the con still sold out, apparently with attendees who only traveled 2-3 hours at most. I predict that, unless the con can add an awful lot more tickets (so people from further away don’t have to plan so far in advance to scoop up admission badges before they sell out), the con’s going to draw mostly West Coasters from now on. Don’t get me wrong; we love our West Coast readers, and have lots of friends in that group that we love seeing there each year. But part of the charm of Comic-Con in years past was getting to see a broader range of our readership. A lot of the fun’s gone out of the con for me personally because of the more narrow geographic focus that seems to be happening unintentionally. WHERE WERE THE SALES? I have this dream that, one year, I’ll bring exactly the right mix and number of publications to a convention, to completely sell out by the last hour of the show, and have nothing to ship back. So far I haven’t achieved that, but this year’s con had the least amount of stuff sent home ever. Knowing how the economy’s been, I (wisely as it turned out) planned ahead, and brought a lot of older publications (including copies of every older magazine issue we had in stock) and put them on sale for half-price. As a result, our sale merchandise was mostly gone by closing time on Thursday (and all gone by the end of the con). Thanks largely to those sale items, our overall sales were only slightly lower than in years past. With the ever-rising costs of attending the con, we’ve got to at least cover our expenses each year (or ideally, show a profit). If not for the sale stuff, I think we’d have had a down year unfortunately. Unlike some other exhibitors I heard from, we did fine, but this was definitely a year for bargain hunters. WHERE WAS THE FUN? I don’t want to sound like an old curmudgeon, saying, “I remember when…”, but this isn’t the same Comic-Con I attended in the 1990s. Its incredible growth makes it the most amazing spectacle you’re ever likely to see, with all kinds of people who’re into all kinds of things; unfortunately, most of those things don’t interest me in the least. I definitely preferred the Comic-Con of a decade or more ago, when you could actually walk the aisles without worrying about your child getting trampled or knocked in the head by somebody’s overstuffed backpack or bookbag. I miss the days when you could get a room at a hotel within easy walking distance of the convention center, and not have to pay a fortune per night. The days when ALL your comics buddies could afford to make the trip, and you’d run into them everywhere you went. Or when they could schedule an hour-and-a-half for the Jack Kirby Tribute Panel, instead of its new one-hour slot (which isn’t enough to give the panelists time to say more than a little, once all the Kirby-related announcements are done). Despite being too short, that panel was the one real “fun” time of the con for me. The rest was pleasant enough, and mostly enjoyable, but it seemed an awful lot like work sometimes, trying to find parking spaces and navigating the trolleys and scrambling to find some decent food to eat without a long wait. Even getting to chat with old friends wasn’t what it used to be, since everyone (including me) needed to hurry off to try to get it all in, or attend some meeting or other. Let me say that I’m continually in awe of how the con committee manages to run such an enormous convention so smoothly every year. It’s nothing short of miraculous, and they certainly do a fine job of focusing on the “comics” stuff that’s still there after all these years. So please don’t think I’m trying to take anything away from their amazing work. Those guys and gals are true super-heroes to manage to pull off such a huge event year after year. But I long for the Comic-Con of years ago, that allowed a small, new Kirby fanzine publisher to afford to take a shot at getting a booth (without being put on a 300-name waiting list), and seeing if there was real interest in what he was publishingâ€”and that eventually helped him to grow an audience by repeat appearances there. As the con’s morphed into the behemoth it is now, I just don’t see how that’d be possible today. And I fear that, as the costs of exhibiting cause more and more comics-related exhibitors to drop out, those empty booths will be filled with non-comics exhibitors from that waiting listâ€”and the Comic-Con of 2020 will have strayed too far away from the one I remember so fondly over most of the last 15 years. We’ll be back next year, but with a single booth instead of the double-size one of this year. It’s clear to me that, at a show of this size and of this wide scope, with so much vying for people’s attention, doubling our booth space doesn’t make much of a difference in drawing attention toward a smaller publisher like us. TwoMorrows can do just fine with a single booth, and that’ll free up one space for someone from that waiting listâ€”hopefully someone who really cares about keeping the “comics” in Comic-Con. 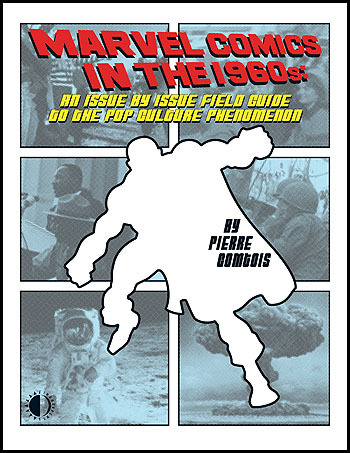 At the request of Marvel Comics, we’ve revised the cover art for our new book Marvel Comics In The 1960s by Pierre Comtois (new art is shown here). While I hate to lose the awesome original cover by Mike Manley and Tom Palmer, don’t worry; there wasn’t any kind of terrible confrontational situation with Marvel over the book. They simply felt it looked too much like a licensed Marvel product with the original piece, rather than the scholarly historical work that it is, and asked us to change it. Marvel was really great about the whole thing, and didn’t require a single change to the interior of the book, so other than the cover, it’s exactly as we envisioned it all along. The book ships (barring any snags on press) on August 28, so should be in stores the first Wednesday in September; a few weeks late because of the extra approval time (and the delay from our being closed for Comic-Con and vacation the last couple of weeks), but the release is just around the bend.